Portland, OR - Revtek’s new three-inch lift system for the Jeep Wrangler JK (part # 587) improves off-road capability without compromising ride comfort. Unlike other systems that use coils to obtain lift, this Revtek lift system employs spacers to lift the front three inches, the rear one inch, for a level ride and room for up to 35 x 12.5-inch tires. 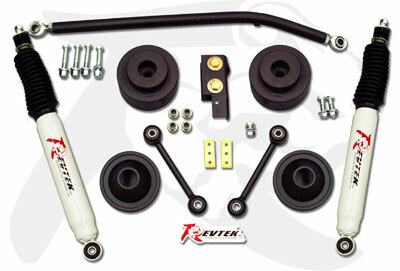 The rear suspension retains the OEM shocks, while the front is fitted with a pair of Revtek performance shocks and a unique adjustable track bar to prevent bump steer. Also included are front sway bar end links, front brake line drop-down brackets, rear track bar relocation bracket and all necessary mounting hardware.